Now that Memorial Day is over, ophthalmologist I assume it’s fair to say that summer’s here. I know, ailment I know. Summer’s not officially here until June 21st, side effects but it’s hot, humid and I’m at the beach every weekend. To me, that means Summer is Here. And with summer comes cookout season. That means you’ll most likely be asked to bring a side dish or two to a backyard BBQ soon. Pasta salad has long since been a favorite potluck dish. It’s easy, you can make it well ahead of time and needs nothing more than a spoon to serve. It’s perfect. And of course, everyone has their favorite version. Some are dressed with mayo and some with vinaigrette. Some are tossed with fruit, some with veggies and many with both. I was really craving cold soba noodles, but wanted to translate those flavors into something a little less…slurpy. Something that would be great on a buffet table. 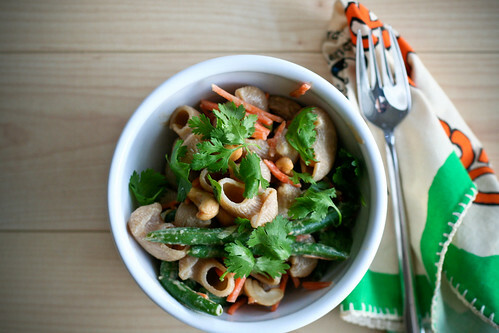 I made this simple pasta salad with whole wheat shells, shredded carrots, green beans, green onions, cashews and a delicious tahini dressing. Topped with fresh herbs, this is going to be the pasta salad I bring everywhere this summer. It’s light and refreshing, but still unique and addicting. Best of all, it would be great with all manner of seasonal vegetables. Hello summer! I would have garnished this with a few sesame seeds, but I was fresh out. Whisk the dressing ingredients until evenly combined. Set aside. Toss the rest of the ingredients in a large bowl, reserving some of the herbs for garnish. Dress evenly with the dressing, making sure everything is well coated. Sprinkle with the remaining herbs. Makes 6 – 8 side portions. I found some lemon basil at our local farm market. It would be perfect in this salad! This looks so good! I get so tired of the usual pasta salad. I can’t wait to try this! Thanks! So colorful and pretty! And for my money I’d defenitely do the basil and cilantro combo! This sounds fantastic! You have included all of my favorite flavors in this dish. This looks so good and delicious. Didn’t you love the milk bar? I am so tired of pasta salads at summer parties….this one sounds so refreshing. Thanks for the good idea, I am making your pork loin this week. any idea what could be substituted for the soy sauce? i’m allergic to soy, but this sounds delicious! how about lime juice maybe? I have sesame allergies to accomodate – any other dressing possibilities without tahini/sesame? Rooster Sauce?!! Seriously? Here I am in Tampa Bay, and I’m supposed to go hunting ROOSTER SAUCE?!! What is it with you people? Ellen: (almost a year later, I note, but still a good topic) As a substitute for soy sauce: Are you allergic to the ingredients in Worchestershire sauce or fish sauce? I wouldn’t use quite as much. And how about a little dab of Spanish smoked paprika (sweet or hot) for depth? I’d throw in a little garlic. Also, my mother is allergic to cashews — I’d consider toasted almonds. Elizabeth – I’ve never tried it without tahini, but I’d guess you can substitute olive oil for the sesame oil and peanut butter for the tahini. You might need to add a little water to loosen it, but that might work. If you try it, let me know how it turns out! MoonRidr, The Rooster Sauce (hot chili sauce) in this can be found at ANY grocery store usually in with the soy sauce or hot sauce. If you have never had it go and get it. It is super good and cheap considering a few drops goes a very long way. Spicy and great on any dish, even pizza. Look for the green cap on a clear bottle with bright red goodness inside and a picture of a rooster on it. Trust me, I am in Indiana and I have seen it in all the grocery stores around here. This recipe looks great! Thank you for posting it!! What’s up every one, here every person is sharing such experience, therefore it’s nice to read this blog, and I used to visit this webpage daily.